UU A Way Of Life: Today's lesson, number 77, "I am entitled to miracles." Today's lesson, number 77, "I am entitled to miracles." Today's lesson, number 77 in A Course In Miracles, is "I am entitled to miracles." What is a "miracle" as the term is used in A Course In Miracles? It is a healing that occurs when one's awareness shifts from the path of the ego, conditional love, to the love of God, Unconditional Love. 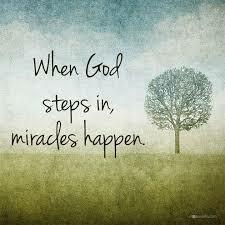 The miracle is similar to what A Course In Miracles calls the "holy instant." The holy instant and a miracle are the apprehension that we are One with Everything. The opposite of the miracle is separation, the egotistical assertion of me, myself, and I. No person is an island. None of us is self contained. As our seventh principle in Unitarian Universalism affirms and promotes, we acknowledge and respect the interdependent web of all existence. It is in becoming aware of this interdependence, this Oneness that miracles occur. It is written in the lesson, "You are entitled to miracles because of what you are. You will receive miracles because of what God is. And you will offer miracles because you are one with God. Again, how simple is salvation! It is merely a statement of your true Identity. It is this that we will celebrate today."